A sudden loss or diminution of sensation and of the power of motion, caused by the rupture or plugging up of a blood-vessel in the cranial cavity and effusion of blood on or within the brain. Ordinarily it is referred to as a "stroke of paralysis." The chief symptoms of this condition are sudden loss of consciousness, of motion, and of sensation, the affected person lying as if dead. 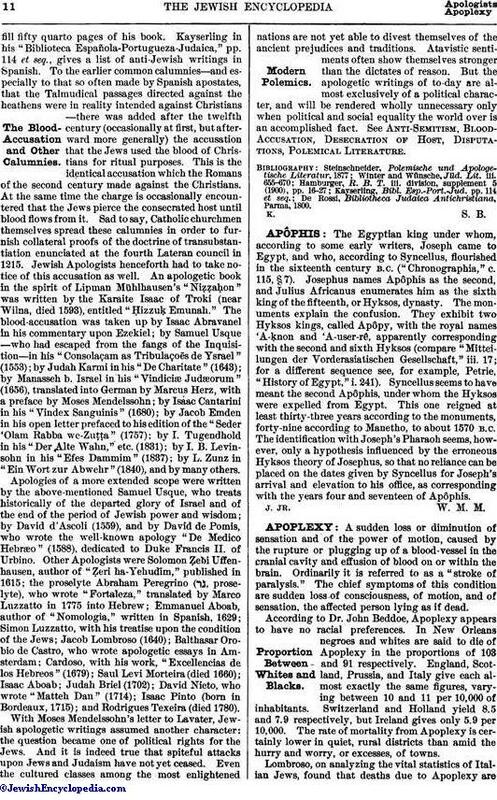 According to Dr. John Beddoe, Apoplexy appears to have no racial preferences. In New Orleans negroes and whites are said to die of Apoplexy in the proportions of 103 and 91 respectively. England, Scotland, Prussia, and Italy give each almost exactly the same figures, varying between 10 and 11 per 10,000 of inhabitants. Switzerland and Holland yield 8.5 and 7.9 respectively, but Ireland gives only 5.9 per 10,000. The rate of mortality from Apoplexy is certainly lower in quiet, rural districts than amid the hurry and worry, or excesses, of towns. Lombroso, on analyzing the vital statistics of Italian Jews, found that deaths due to Apoplexy aretwice as frequent among them as among the general population of that country. He attributes it to the emotional temperament of the Jew, to his reputed avarice, his constant struggle with adverse conditions of life, and the ceaseless persecution of the race. Lombroso further intimates that the frequent marriages of near kin among Jews, and the greater development and use of their brains, are also predisposing causes. The writer has compiled some statistics of American Jews, and finds that, in New York at least, the Jew is no more liable to Apoplexy than is the non-Jew. 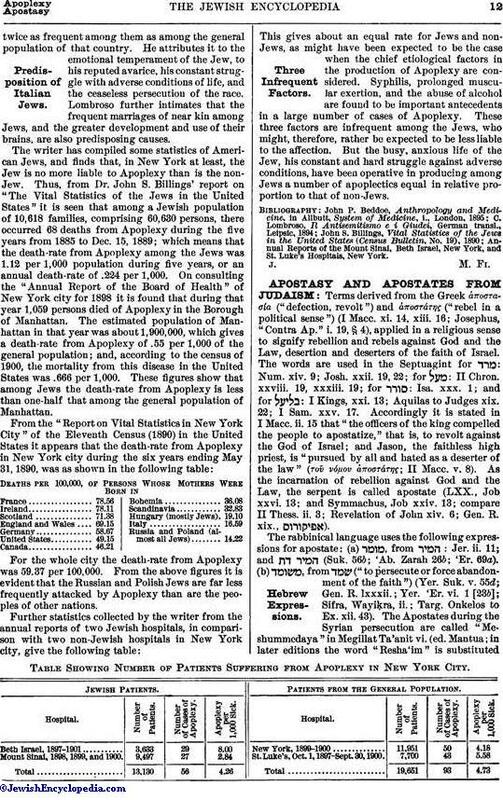 Thus, from Dr. John S. Billings' report on "The Vital Statistics of the Jews in the United States" it is seen that among a Jewish population of 10,618 families, comprising 60,630 persons, there occurred 68 deaths from Apoplexy during the five years from 1885 to Dec. 15, 1889; which means that the death-rate from Apoplexy among the Jews was 1.12 per 1,000 population during five years, or an annual death-rate of .224 per 1,000. On consulting the "Annual Report of the Board of Health" of New York city for 1898 it is found that during that year 1,059 persons died of Apoplexy in the Borough of Manhattan. The estimated population of Manhattan in that year was about 1,900,000, which gives a death-rate from Apoplexy of .55 per 1,000 of the general population; and, according to the census of 1900, the mortality from this disease in the United States was .666 per 1,000. These figures show that among Jews the death-rate from Apoplexy is less than one-half that among the general population of Manhattan. For the whole city the death-rate from Apoplexy was 59.37 per 100,000. From the above figures it is evident that the Russian and Polish Jews are far less frequently attacked by Apoplexy than are the peoples of other nations. Table Showing Number of Patients Suffering from Apoplexy in New York City. Patients from the General Population. Number of Cases of Apoplexy. This gives about an equal rate for Jews and nonJews, as might have been expected to be the case when the chief etiological factors in the production of Apoplexy are considered. Syphilis, prolonged muscular exertion, and the abuse of alcohol are found to be important antecedents in a large number of cases of Apoplexy. These three factors are infrequent among the Jews, who might, therefore, rather be expected to be less liable to the affection. But the busy, anxious life of the Jew, his constant and hard struggle against adverse conditions, have been operative in producing among Jews a number of apoplectics equal in relative proportion to that of non-Jews. Annual Reports of the Mount Sinai, Beth Israel, New York, and St. Luke's Hospitals, New York.